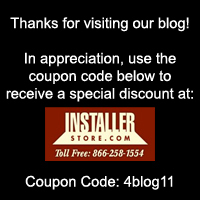 It’s that time again for the Installerstore Halloween Coupon Code Event! Here is your chance to SAVE 6% on your order AND help an Installerstore employee win a special prize! Now through October, you can vote for your favorite staff member’s pumpkin carving by using their corresponding coupon code. Not only do you help that employee get closer to winning the prize, but that code will save you 6% on your entire order! But Hurry! The coupon code event is through October only. Winning pumpkin carving will be announced Monday November 2. To participate, simply choose your favorite carving from the 8 entries below. Use the corresponding coupon code during checkout. This casts your vote for the favorite carving but also saves 6% on your entire order! These coupon codes cannot be used with any other promotion/discount. Coupon codes are valid on Installerstore.com site only. This discount cannot be applied to previous (past) orders.